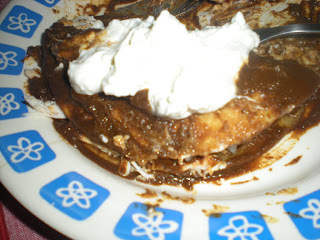 Here comes some real Mexican enchiladas with mole topped with a mix of crumbled cheese and sour cream. This dish has a bit of spiciness, sweetness and chocolate, which is what you find in mole. 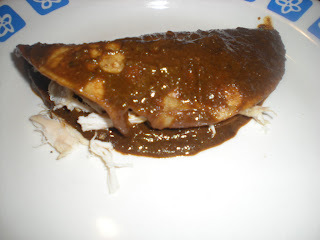 Mole poblano is the specific name of this sauce, a blend of several ingredients. It contains a combination of 4 popular Mexican chili peppers, nuts, Mexican chocolate and spices. This sauce is complicated to make by scratch and it is better store-bought. 2. 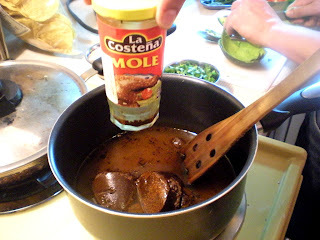 In a medium saucepan, add mole and water over medium-high heat. Boil and stir occasionally until dissolved. 3. Meanwhile, combine sour cream, cream cheese and feta cheese. 4. On a frying pan, heat oil over medium-high heat and pan fried tortillas until slightly crunchy and still bendable. 5. 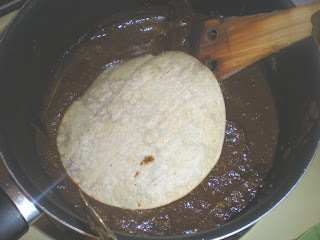 Dip tortilla in mole. 6. 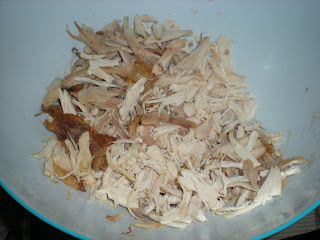 Place tortilla on a plate and fill it with chicken and chopped onion. Fold it and top with cheese mix. I like how it's covered in that delicious sauce! yum!